The World of Warcraft showed it great power as the King of MMO in January. Only the alpha test state of the game upcoming expansion, the Legion, can even have a good impact on RMT market while the same kind of expansion update didn't create any effect at all for other games. 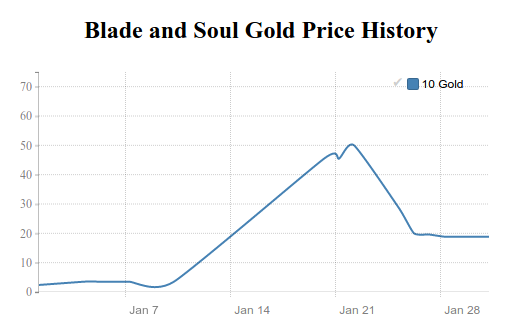 The recent release Blade and Soul was launched perfectly with the very fluctuate gold price. Other game in-game currencies prices were mostly lower than December 2015. Let's take a closer look. Archeage Gold price had been slightly increased in January. There was around 15% rise in price during the 2-3rd week of the month due to the double experience events from Trion. It’s believed that Archeage Gold price should be even higher in February because of the upcoming patch 2.5 update “Bloodsong” The cheapest Archege gold was on January 28, 2016, which is 2,000 ArcheAge gold for (US) $33.99 and the most expensive was on January 20, 2016, for $38.60. The difference rate was 13.56%. EVE Online ISK price was in the rate of 2bl ISK per $36 USD for the whole January except on the 3rd week. The ISK price was around 10% decrease during that period. This year EVE Online will have a lot more features as mentioned by its Executive Producer. More information will be gradually released with the upcoming Fanfest 2016. EVE Online ISK price has a tendency to rise again in February after this event. The cheapest was on January 20, 2016, which is 2bn EVE ISK for $32.11 and the most expensive was on January 01, 2016 for $36.00. It was 12.11% different. This is the month to remember for FFXIV Gil. Its sudden 15% drop in the last week of January resulted in the cheapest price ever since its Realm Reborn release back in 2013. However, it's highly believed that this decline should only last temporary and have a chance to recover again within in a few weeks. The cheapest was on January 27, 2016 which is 5mn FFXIV gil for $14.46 and the most expensive was on January 01, 2016 for $20.19. There was a 45.58% difference. Guild Wars 2 Gold price in the first two weeks was exactly the same as in the last day of December, which was $29.22 for 500 GW2 Gold. There was a 17% price decrease during January 22-25 from an unknown reason. Although Guild Wars 2 just released its very first 2016 update on January 26, adding several features to the game such as gliding in the Central Tyria, Guild Wars 2 Gold price should not have any impact at all. 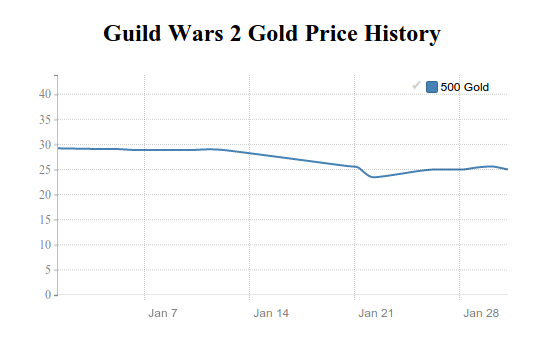 The cheapest was on January 22, 2016 which is 200 GW2 gold for $22.33 and the most expensive was on January 01, 2016 for $29.22. The increase rate was as high as 30.86%. The force did not only awaken in the Star Wars film, it made the same thing in SWTOR Credits price as well. After the release of the movie on December 18, 2015, SWTOR Credit price had been significantly increased. The rise reached its peak on January 4, 2016, $29.38 for 10mn Credits and had been staying in the same range for almost the whole month. The impact of the Force Awakens should not disappear easily. SWTOR Credits price should not be much different in February. The cheapest was on January 27, 2016 which is 10mn SWTOR US Credits for $25.45 and the most expensive was on January 04, 2016 for $29.38. The discrepancy rate was 15.44%. Tara Gold price had been slightly decreased again in January 2016 as predicted in our December 2015 RMT Roundup. Thanks to the double dungeon drops events during Jan 22-25, Tera Gold price was on a rise again. Although Tera Gold price kept changing for the whole month, the discrepancy rate was even less than 10%. Tera Gold price is expected to be higher in February. The cheapest was on January 22, 2016 which is 20,000 Tera Gold for $20.47 and the most expensive was on January 27, 2016 for $22.44. It was only 9.62% different. WildStar Gold price had been staying in the same range as in end of December as predicted in our December 2015 RMT round up. Starting from January 25, 2016, WildStar Gold price suddenly started to decline with an unknown reason. It's believed that price for WildStar in-game currency should be fluctuated for a while in February with the slight decrease in price. The cheapest was on January 29, 2016 which is 5,000 gold for $41.61 and the most expensive was on January 1, 2016 for $49.64. The different rate is as high as 19.30%. Alpha test for the upcoming World of Warcraft's expansion “The Legion” made its return again in January. 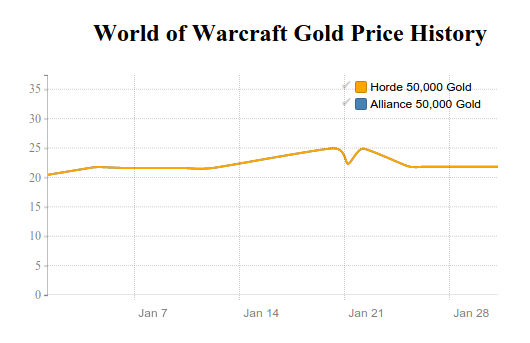 And it came with the 15% rise in WoW Gold price for almost two weeks after it had been staying at the rate of $21.61 per 50k gold for almost the whole month. Even though being only an alpha test state, the new World of Warcraft expansion still has a significant impact on the RMT market. WoW gold price tends to increase each month until the full release of the Legion in September 2016. If you are planning to purchase the World of Wacraft gold, this is your best time of the year. The cheapest was on January 01, 2016 which is 50,000 gold for $20.45 and the most expensive was on January 20, 2016 for $24.95. The discrepancy rate was 13.67%.